Emma wanted to play on Daddy’s computer yesterday, so I figured I’d download BabySmash and give it a shot. She loved it! She can bang around on the keys as much as she wants to and watch the letters and happy faces (her favorite) pop up with laughter. 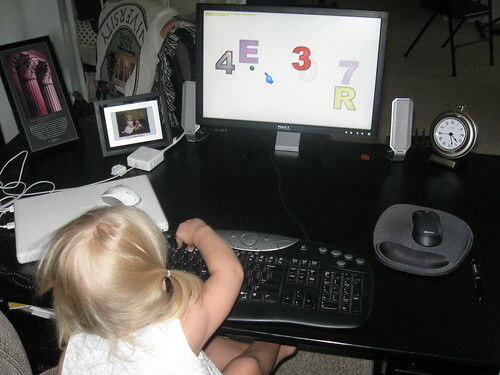 BabySmash is a .Net application that Scott Hanselman wrote for his children using WPF. I wrote BabySmash! for my 2 year old and 5 month old so they could bang on the keyboards of my Windows machines without hurting anything. It’s a copy/homage of the very fine and free AlphaBaby for the Macintosh. BabySmash is free also and I’ll release the source code on my blog soon. Enjoy.